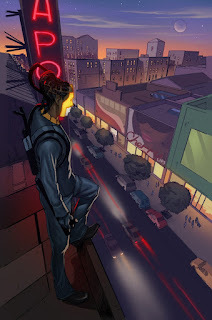 The Newest Rant: A Kickstarter That Looks Fascinating--"Ajala: A Series of Adventures." A Kickstarter That Looks Fascinating--"Ajala: A Series of Adventures." Mr. Harris was kind enough to provide me a PDF of what had been completed of the issues the collected book would contain (issues 5 and 6 are still being made, as the campaign discusses), and I loved what I read. I can see why Ajala’s series has won two Glyph awards (for best female character) as it contains a stellar mixture of action, socio-political discussion, and a frank portrayals of race throughout. The current-events elements never come off as ham-fisted or shoehorned in, as some comics seem to struggle with when they try to discuss, "The world outside our window," but instead the stories of Ajala handle everything great in regards to social issues as well as scenes of action jam-packed with stellar illustration. The campaign has not yet reached its funding goal and only has six days left, so if you are interested in backing it I would encourage you to do so ASAP. With the fantastic artwork of N. Steven Harris and a story by Robert Garrett I know I'm hoping the book gets the needed funds!